A ‘FULL PAGE‘ means that ALL the Search Dog Teams were requested to attend. A ‘LOCAL DOGS‘ means that only that MRT Search Dogs/neighbouring Search Dogs were requested. 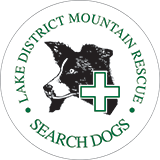 – this means that the missing person’s location has already been indentified, (eg lights seen, whistles heard, SARLOC, rough location given to the MRT) and the Search Dog Team have pinpointed their exact location, position. – this means that the missing person’s location was not known and the dog found them with no other assistance.